Currently, I am on a mission to find some new healthy fun snacks to eat. Last weekend, we stopped at Whole Foods to find a specific muffin mix, when I stumbled upon these goodies. The bag was opened half way home, I was a bit hungry and honestly, curious about them. The first thing I noticed is that the crisps are shaped like a real pea. Popped one in my mouth, I’m not sure what I was expecting but I was pleasantly pleased. They are crunchy, with the right amount of salt and good flavor. Serving size is 22 pieces but um.. honestly, it is more like two. You will find yourself reaching for one and then another and another. It is really hard to stop munching on them. 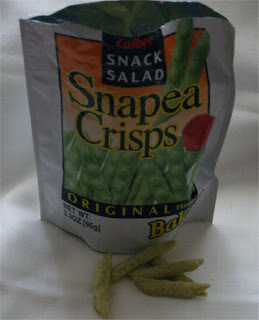 Want to read more about Snapea Crisps.